One of the best Remixers of the 80'ies Dance scene. He always thought of a DJ as a guy playing records on the radio, but when he entered the Sanctuary nightclub in Manhattan in the late seventies his life changed forever... When he heard the DJ mixing two songs together he definitely knew he wanted to become a professional Discotheque DJ! During 1978 to 1981 all the hottest clubs, like Electric Circus and the legendary Studio 54, all wanted to hire Jellybean to play in their club. From April 1981 'til June 1984 he was the resident DJ of the Manhattan club Fun House. It was during his sessions at this club the well known phrase "Jellybean Rocks the House" was founded! The crowd at the Fun House was very musically aware and Jellybean got total freedom to explore dance music and examine the break beats, instrumental fills and all the other components of the 12-inch extended mixes. His style was so popular that he were asked to host a weekend dance show in America's No.1 radio station - WKTU. John had achieved his DJ goals and he now wanted to go on to remixing singles. His first remix was "the Bubble Bunch" by Jimmy Spicer, later followed by the classics "Walking on Sunshine" by Rockers Revenge and Africa Bambaataa's "Planet Rock". In 1978 he remixed the 12" single of "(Dance It) Freestyle Rhythm" by Mantus. This was also among the very first 12" singles he remixed and it was Jellybean who also mixed the Mantus album that followed the single. All he actually was allowed to do in the remixes back then, was to take the existing track and make a good intro to it and a nice break. Although he wasn't allowed to do any overdubs or tonal changes, his remixes became very popular, especially since he played them in his radio show. 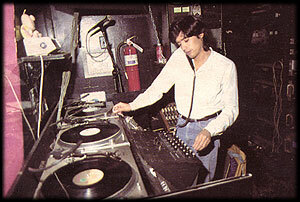 Many of the remixes he played wasn't available in the stores, and for example Jellybean's remix of "Flashdance" by Irene Cara was very sought for. This helped to get the record companies aware of the audience's demand of commercial available 12-inch single remixes. The song "Flashdance... What a feeling" was written by Giorgio Moroder who also won an Oscar for best motion picture song with it! John Benitez's "In the bush" medley is so super, they had to close the park. Tom Savarese presented the world premiere of Musique "In the bush" way back in vol.1 #12... John's new version probably won't get played on the radio, but will give you some new tricks to throw at your audience giving a truly great song some new twist. John began spinning in January, 1975. He's a 21 year old Scorpio, and currently plays at the Barefoot Boy and Fifth Avenue, Disconet's newest big apple subscripter. He is studying marketing and sales promotion at Bronx Community College, says that Cerrone is his favorite artist, Walter Gibbons and Tony Smith his favorite DJ's and Bob Viteritti's dance and feel medley his favorite Disconet side. In addition to doing the "In the bush" medley for this Disconet program, John just complete the mix of "(Dance it) Freestyle rhythm" by Mantus, which will be coming out on SMI records. The medley also stars a powerhouse flashback to Montreal Sound's "Music", which was one of summer 77's hottest disco songs. 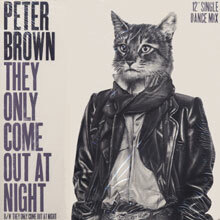 Other memorable remixes are the ones he did for Peter Brown - "They only come out at night" and "(Love is just) the Game", which are some of my very favorite tracks. But the list of acts he has remixed is long - very long... Just look at names like Whitney Houston, Jocelyn Brown, Patti Austin, George Benson, Shalamar, James Ingram, Dan Hartman, Hall & Oates, Billy Joel and Pointer Sisters. Jellybean also remixed the classic Paul McCartney & Michael Jackson hit "Say, say, say", among with many other now classic songs, like Freeez's - "I.O.U". In 1982-83 he helped his girlfriend at the time to remix her songs, starting out with "Everybody" and followed by "Physical attraction", "Borderline", "Lucky Star" and her radio breakthrough - "Holiday". "Holiday" was the first song he ever produced from scratch and the girl was of course... Madonna!!! Madonna often worked with her friend Stephen Bray, and when Stephen's own group Breakfast Club was releasing their (unfortunately) only album, John was called in to remix the first single - "Right on track". This is one of my all time favorite songs, and Jellybean have made a groovy mix with a awesome intro were he adds instrument after instrument which makes the song slowly build into a real dance smacker! Jellybean now started to produce other acts and he also got into song writing. He also created and mixed tunes for motion picture soundtracks like "Flashdance", "Footloose", "Top Gun" and "Back to the future". He also remixed the Debbie Harry [Blondie] track "Feel the spin", which was a 1984 top 10 Dance single from the "Krush Groove" movie. Next step in his career was to release a record in his own name. In 1984 he release a cover of the Babe Ruth's 1972 classic "the Mexican", inspired by the Bombers 1978 version he brought new life to this hit. He even managed to track down Janita Haan, the original singer from Babe Ruth, to sing in his version. The song really worked the dancefloors and reached the No.1 spot in the Billboard Dance Charts. 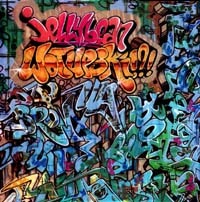 The song was included in a 5-track EP called "Wotupski!?!". The EP also included another song that also reached the No.1 spot of the same Charts, namely "Sidewalk Talk". 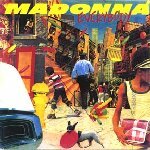 This song was written by John's former girlfriend Madonna, and she also did the background vocals in that song. Jellybean sends a special thanks to Madonna in the inner sleeve, saying just "Goo goo gaa gaa"???!!! Some other famous people involved with the "Wotupski !?!" EP, was (among others) for example the late disco writer/producer Dan Hartman and one of the Chic-guys - Nile Rodgers! 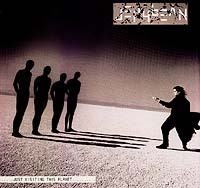 In 1987 he released the album "Just visiting this planet". In this album he tried a new idea he had... He wanted the songs to have various stages of relationships, so he decided to use 3 different singers in the album - Elisa Fiorillo, Adele Bertei and Steven Dante. He also choose to record the songs the reverse way of how songs traditionally are recorded. He made sure to first capture the best vocal performances before fitting the rhythms around the vocals. Usually the vocals is the last thing that's added. 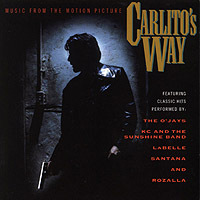 4 of the album's tracks made their way into the charts... "Who found who" (with vocals by Elisa Fiorillo) made it all the way to No.1 in the Billboard Dance Charts. This position did also "the Real Thing" (Steven Dante vocals) reach! Jellybean's version of Candido's disco classic "Jingo" made it to No.1 in the Billboard Hot 100. The song "Just a mirage" also reached high in the charts but never made it 'til the top spot... The album sold over a million and a half copies worldwide!!! People like Siedah Garrett (who have been singing and writing for Michael Jackson), Jocelyn Brown (great vocalist of Musique and Inner Life), Paulinho DaCosta (great percussions player) and "Little" Louie Vega (famous DJ and Remixer) have added their talents to this album. Following up the success of "Just visiting this planet", John decides (as the remixer he is) to release a remix album. 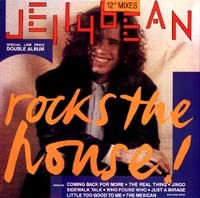 The result is "Jellybean Rocks the House" in 1988. This is a double record set of remixes and re-remixes specially made for dancing to. All songs are in long 12"single versions... It's almost like a greatest hits album, all the old hits are remixed or even re-remixed and there is also a new track called "Coming back for more" with vocals by Richard Darbyshire. Richard is the singer of the group Living in a Box which hit the charts in 1987 with their song with the same name - "Living in a Box". John continues to produce other artists like Whitney Houston, E.G. Daily, Hot Streak, Sheena Easton and the lady with the powerful voice - Jocelyn Brown, just to mention a few. John produced Jocelyn's classic "Love's gonna get you", a song that's one of the most sampled dance tracks. It was for example used in Snap's "the Power". This song is one of he's own favorite works and he says "I still get a tremendous rush every time I hear that song". 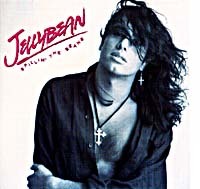 Jellybean returns again as an artist in 1991 with the album "Spillin' the beans". Again he's using different singers for the tracks... This time the vocalists are Niki Haris, Cindy Valentine and DeAnna Eve. It's Niki who sings the album's biggest hit - "What's it gonna be". This song becomes a major dance/club hit and was followed by the album's not as successful James Brown inspired title track "Spillin' the beans". Other people that have credits in this album are, Siedah Garrett, Roy Ayers (legendary vibraphone player and writer), John Oates (of the group Hall & Oates), Paulinho DaCosta and... Cindy Crawford!!! Cindy was part of "the party people" in the song "Do you love as good as you look". 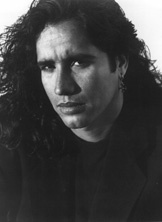 Since then John "Jellybean" Benitez have started his own Jellybean Productions with a record label, JB Recordings, and a publishing company, JB Music Publishing. Through his companies he has released many Dance music acts as well as Spanish releases. He also released the Disco Classics CD 'Joe Causi presents Greatest Dance Classics of All Time'. He has also been an expert music supervisor for Hollywood movies like Carlito's way and he has co-written the theme for the Ricki Lake show among other TV-shows. In a ceremony in September 19, 2005 in New York, Jellybean got full recognition for his successful DJ career when he, along with DJ colleagues Francois Kevorkian and Frankie Knuckles, were voted into the Dance Music Hall of Fame! DJ's already in the Hall of Fame were David Mancuso, Larry Levan and Tee Scott. Remixer award was received by Francois Kevorkian and in 2004 it was given to Tom Moulton. Other members in the exclusive Dance Music Hall of Fame are Gloria Gaynor, Donna Summer, Bee Gees, Barry White, Chic [Nile Rodgers & Bernard Edwards], Sylvester, Giorgio Moroder & Pete Bellotte, Quincy Jones and Gamble & Huff. There are also some 10 songs inducted as well. In the same ceremony, WestEnd Records's Mel Cheren received a 'Lifetime Achievement Award' for his work throughout the years, an award also honored Henry Stone of T.K. Disco fame in the 2004 Awards.